The Nikola Motor Company has announced the Nikola One, a hydrogen-electric powered truck which will be released with its on refueling infrastructure. People often criticize the scalability of hydrogen-electric (HE) vehicles given requirements for an entirely new infrastructure based on a difficult-to-manufacture material. The Nikola Motor Company aims to change that. Their Nikola One improves upon previous HE vehicles, and the company has developed a plan to provide new infrastructure across the U.S. and Canada. In our modern day, most automobiles still burn fossil fuels for energy. This is due to a number of variables, not the least of which is a well-established fossil fuel energy infrastructure. Yet, the push for clean energy has made significant strides. While there are many electric motors on the market, the Nikola One may help expand the clean energy field. True to their name, the Nikola Motor Company is creating products that innovate how we make use of electricity as an energy source. While plug-in electric vehicles such as the Tesla Model S require long charging times and have limited range, Nikola’s HE engine promises shorter charge times and a longer driving range. Announced last Thursday, the Nikola One is a hydrogen-powered truck able to travel 1,200 miles before refueling, compared to 124 miles for the Mercedes‘ electric truck. In addition to the vehicle’s impressive range, Nikola One refuels in a scant 15 minutes. That’s four times faster than most electric vehicles even when using fast-charging networks. The truck’s hydrogen fuel cells and 320 kWh battery produce over 1,000 horsepower and 2,000ft.-lb of torque. These stats are compelling to transportation companies looking to add efficient new engines to their fleet. According to Nikola CEO Trevor Milton, the startup has received $4 billion in reservations, and it plans to deliver beginning in 2020. HE vehicles aren’t exactly a new idea, but companies have avoided using them because they require a whole new infrastructure to be viable. An HE company would need to streamline both hydrogen production, refueling infrastructure, and delivery to consumers. To address this, Nikola is planning to open 364 hydrogen fueling stations between 2018 and 2019. Nikola will produce their hydrogen fuel by utilizing solar-powered electrolysis plants. As a bonus, the vehicle’s lease agreement covers the cost of fuel. To open up these stations, Nikola has paired up with Ryder, an established truck rental and fleet management supply chain that has 800 service locations on the North American continent. 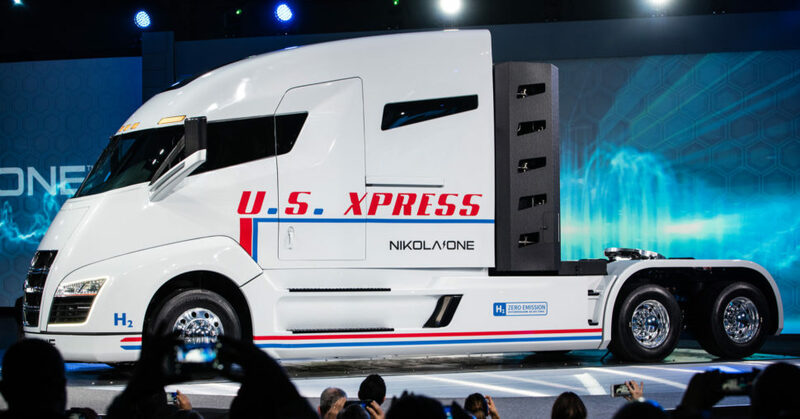 Nikola also announced a system called Nikola Shipments, which will allow freight brokers to coordinate with independent drivers to get their cargo delivered. According to Milton, this is like Uber for the trucking industry. Providing infrastructure is a huge step toward making HE vehicles practical. If Nikola Motors finds success with this product, it could pave the way for more consumer-based HE vehicles. Electric UTV Nikola Zero is Packed With More Torque!